This City of Vandalia map shows road and intersection closures during Friday’s Vandalia-Butler Chamber of Commerce Air Show Parade. VANDALIA – The City of Vandalia has announced temporary road closures on Friday, June 22 to accommodate the Vandalia-Butler Chamber of Commerce Air Show Parade. Maple Avenue and James Bohanan Boulevard will have traffic restrictions beginning at 4:30 p.m. due to parade staging. Access will nbot be blocked, but motorists will be re-directed around staged vehicles. Road closures will take place from 6:50 p.m. until approximately 9 p.m. or the conclusion of the parade. North Dixie will be CLOSED from National Road to Northwoods Boulevard and National Road will be CLOSED from Ranchview Drive to North Dixie. Access in and out of the Skyview Plat will be limited during this time. 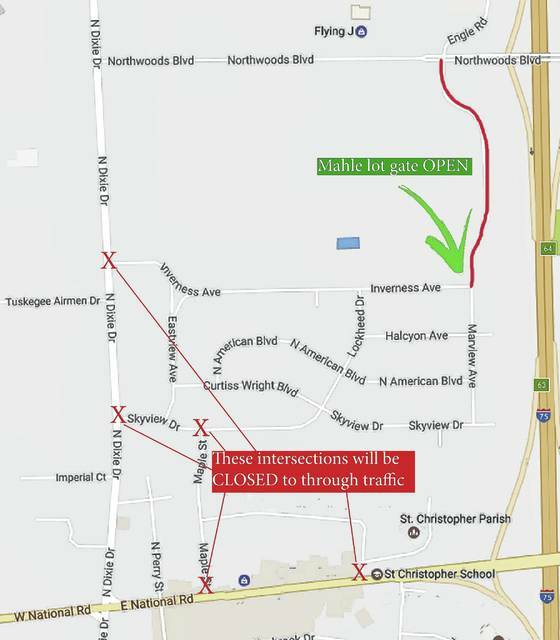 The Mahle lot gate at the north end of Marview Avenue will be open throughout the duration of the parade, giving vehicles access to Northwoods Boulevard. https://www.vandaliadrummernews.com/wp-content/uploads/sites/19/2018/06/web1_PUBLIC-NOTICE-AIR-SHOW-PARADE-3.jpgThis City of Vandalia map shows road and intersection closures during Friday’s Vandalia-Butler Chamber of Commerce Air Show Parade. Reach Darrell Wacker at 937-684-8983 or on Twitter @VandaliaDummer.